I'm a sucker for high school records. Unfortunately most of the ones I happen upon don't adhere to that whole separation of church and state thing, and sound more like Sunday cathedral recordings. Then there are the musical offerings of Boulder's Fairview High School band, Excalibur vocal group, and its jazz ensemble. 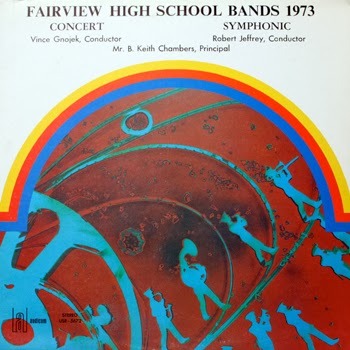 Fairview has had, at certain times in its 50+ year history, various music programs including eight choirs, numerous bands (including The Classic Knights), three jazz bands, jazz combos, and a string orchestra. With all of this homegrown talent, it seemed obvious to record albums. The first one I came across was a 1972-1973 standard issue band recording (Audicom 5672). Lots of classical stuff here. The second release I found was completely different. 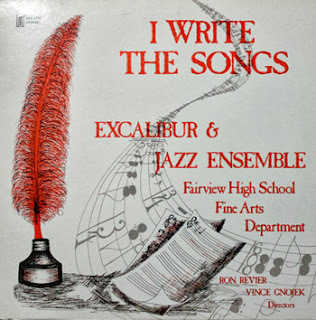 I Write the Songs was recorded and released in 1976 (Audicom 8714). You can tell these kids are having a blast belting out the pop songs, much like one of my other favorite high school finds, from Cañon City High. Yes, there are three Barry Manilow covers. Personal preference has me favoring the uptempo "It's a Miracle." Unfortunately, the "Lennon/McCartney Medley" is a Muzak sounding selection of the Beatles slower hits, "Here, There, Everywhere," "And I Love Her," and "Long and Winding Road." Maybe because I just finished reading the outstanding Shell Shocked: My Life with the Turtles, Flo and Eddie, and Frank Zappa, etc., by Howard Kaylan and Jeff Tamarkin, that my favorite cut on here is "Happy Together." Excalibur and the Jazz Ensemble were no strangers to recording. 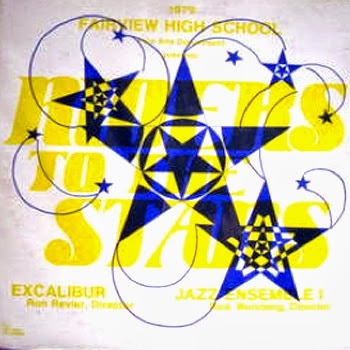 I also found a 1979 LP, Riders to the Stars (Audicom 3703), which features a Beatles cover of "Got to Get You Into My Life," and yet another Manilow standard, "Copacabana."